2013 has been a very busy year for Uli Jon Roth with over 100 gigs scheduled and he made his second visit in 12 months to The Box in Crewe last Saturday. It was the first of 2 gigs in 2 days (the other at the Diamond in Sutton-In-Ashfield) before he returns next month for 8 double headlining gigs with Diamond Head. Uli likes to change his setlist around but we were treated to a 2hr show predominantly featuring material from his period with the Scorpions as it is the 40th anniversary of the year he joined the band and played on 4 studio albums and 1 double live album until 1978. A very appreciative crowd at the The Box welcomed Uli playing here once again and at times he seemed lost in his music as he peeled off solo after solo on his self invented Sky guitar which has additional frets to emulate the higher notes of a violin. He brought with him a very tight backing band who had to be on the ball as there was no setlist and had to rely on intros and hand signals from Uli to know what song was to follow. Special mention is made to guest vocalist Nathan James who joined the band for Sails Of Charon and We’ll Burn The Sky. The show began with 3 of Uli’s solo numbers then he stated about the set being mainly made up of vintage Scorpions material as the opening chords of They Need A Million rang out. The band barely paused for breath apart from when a snare drum broke so Uli played an improvised jam with 2nd guitarist Ali Clinton and keyboard player Paul Rahme. There were many classics played including In Trance, Fly To The Rainbow,Pictured Life and some nice obscure ones like Sun In Your Hand but my song of the night was set closer Catch Your Train with Ali throwing out a guitar solo with it behind his head! Curfew time was nigh but the show was not over until we were treated by 2 stunning covers of All Along The Watchtower by Bob Dylan and Little Wing by Jimi Hendrix with Uli hitting notes to raise the hairs on the back of your neck! 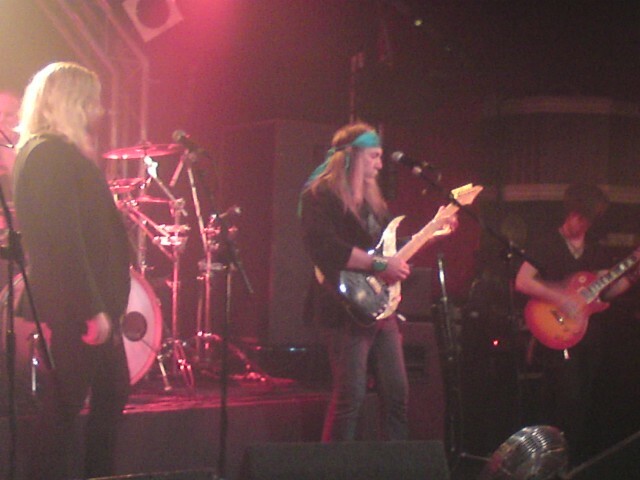 Uli Jon Roth – Guitar/vocals. Nathan James – Guest vocalist on Sails Of Charon and We’ll Burn The Sky. Owen Davidson – Bass guitar/vocals. I award the show 9.5/10.